Cross-Culture Stereo Used To Be A Stove | OhGizmo! Created with the intentions of inspiring people to re-purpose old appliances and gadgets instead of just discarding them, Tyler Held’s Cross-Culture stereo system is cleverly built into an old 4-burner stove. 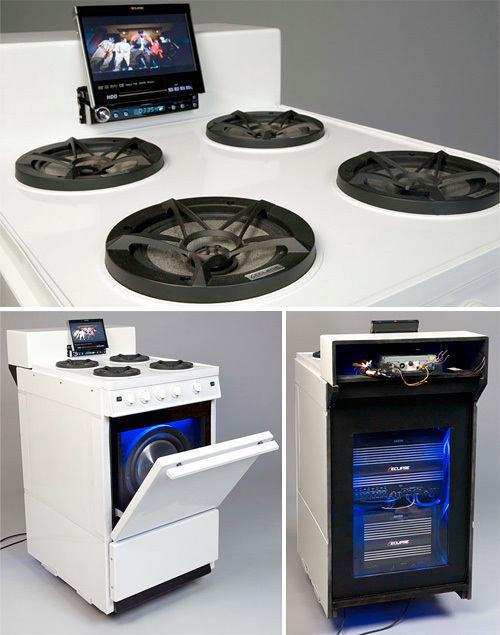 Using components from an Eclipse system designed for cars, each of the burners have been replaced with 6.5-inch speakers with tweeters, while the oven now hides a 12-inch sub-woofer. And the control panel where you’d normally find dials and a clock has been wiped clean of clutter and replaced with a 7-inch pop-up touch screen head unit for accessing your music library or playing DVDs. Up next, hopefully a way to convert my broken microwave into an answering machine, since ‘converting’ it into a sock warmer is what did it in.